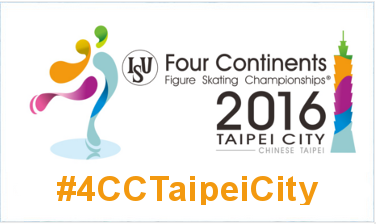 The 2016 ISU Four Continents Figure Skating Championships will open in Taipei, Chinese Taipei, this week. The ISU Four Continents Figure Skating Championships return to Taipei for the third time. Taipei has hosted the ISU Four Continents Figure Skating Championships in 2011 and 2014. A total of 98 skaters from 15 ISU members have been entered for the Championships. Skaters/couples need to have obtained a minimum total technical score in Short Program and Free Skating in order to compete at the Four Continents Championships. Three reigning Four Continents Champions are back and hope to defend their title. In the Men’s event reigning Four Continents Champion Denis Ten (KAZ) is aiming at defending his title, but has to expect stiff competition. Ten, who comes with a seasons best of 276.39 points to Taipei, will face current ISU Grand Prix Final bronze medalist Shoma Uno (JPN/seasons best 276.79 points) and three-time World Champion Patrick Chan (CAN/seasons best 271.14 points). Other medal contenders include ISU Grand Prix Finalist Boyang Jin (CHN), defending Four Continents bronze medalist Han Yan (CHN), 2015 Skate America Champion Max Aaron (USA), 2014 Four Continents Champion Takahito Mura (JPN) and 2012 Four Continents bronze medalist Ross Miner (USA). Reigning World and Four Continents silver medalist Satoko Miyahara (JPN) headlines the Ladies field. The current ISU Grand Prix Final silver medalist has earned a seasons best score of 208.85 points. Competition should come from ISU Grand Prix Finalist Gracie Gold (USA/seasons best 202.80 points) and 2015 Four Continents bronze medalist Rika Hongo (JPN/seasons best 195.76 points). Kaetlyn Osmond (CAN), Alaine Chartrand (CAN), 2014 Four Continents bronze medalist Zijun Li (CHN), 2014 Four Continents Champion Kanako Murakami (JPN) and Mirai Nagasu (USA) can challenge for the podium as well. Current World and Four Continents Champions Meagan Duhamel/Eric Radford (CAN) are aiming at defending their title. The couple set a seasons best of 216.67 points at the ISU Grand Prix of Figure Skating Final. World silver medalists Wenjing Sui/Cong Han (CHN/seasons best 215.62 points) as well as the ISU Grand Prix Finalists Xiaoyu Yu/Yang Jin (CHN/seasons best 197.75 points) and Alexa Scimeca/Chris Knierim (USA/seasons best 191.97 points) want to challenge the leaders. Other teams to watch out for include U.S. Champions Tarah Kayne/Daniel O’Shea, Lubov Iliushechkina/Dylan Moscovitch (CAN) and Marissa Castelli/Mervin Tran (USA). 2015 Four Continents Champions Kaitlyn Weaver/Andrew Poje (CAN) are aiming at a third title at the event. The 2015 World bronze medalists have set a seasons best of 182.66 points when they won the ISU Grand Prix of Figure Skating Final earlier this season. However, 2015 World and Four Continents silver medalists Madison Chock/Evan Bates (USA/seasons best 177.55 points) and newly crowned U.S. Champions Maia Shibutani/Alex Shibutani (seasons best174.92 points) look ready to challenge the Canadians. Other top contenders are 2014 Four Continents Champions Madison Hubbell/Zachary Donohue (USA) and 2014 Four Continents silver medalists Piper Gilles/Paul Poirier (CAN). Please note that for the seasonal best total scores only the ISU Grand Prix competitions (senior and junior) and ISU Challenger Series events have been taken into consideration, not other international competitions or National Championships.